A complete story sources conflict from four different distinct areas. Every engine needs a fuel source. Without a constant supply, the mechanism sputters and fails, eventually coming to a rest dormant and forgotten on a dried plain. How does one keep the bristling and shiny furnace of story steaming down those tracks? the problem faced by the characters. Conflict happens when characters are against each other, like teams in a game or two groups fighting on the playground. But when it comes to crafting a story’s unique personality that sits apart from all the others, that delves deep into the inner psychological needs that audiences crave, an Author needs to understand in detail the forces that craft that conflict. Conflict is the product of effort to resolve an inequity as it meets resistance. We look for conflict as we attempt to identify an inequity’s source(s). If we neglect to look in all the possible places conflict can exist, we open ourselves (and the story) to missing the entirety of the conflict and a true understanding of the inequity, leaving the real likelihood of failing to resolve the inequity thoroughly. So, all four perspectives and all four domains must be explored in order to understand the nature of an inequity and the nature and source(s) of conflict generated by trying to resolve the inequity. The four perspectives Huntley speaks of were well known before Dramatica. First person, third person, first person plural and third person plural. I, You, We and They. As explained in more detail within the article Writing Complete Stories, these four contexts have found their way into stories via the Main Character (I), the Influence Character (You), the Relationship Story (We), and the Overall Story (They) Throughlines. Hearing this for the first time, one might think Well, that seems right, but I’m not sure… Rest assured, there is a reason why these four throughlines appear in complete stories. Ever heard the idea that “One man’s terrorist is another man’s freedom fighter.” This enlightened understanding of the world around us can offer much needed appreciation of why some stories simply feel more whole than others. How else can one truly be sure they are crafting a balanced story if they leave out one side of the argument? Authors need to inspect an issue from every direction—the four Throughlines. 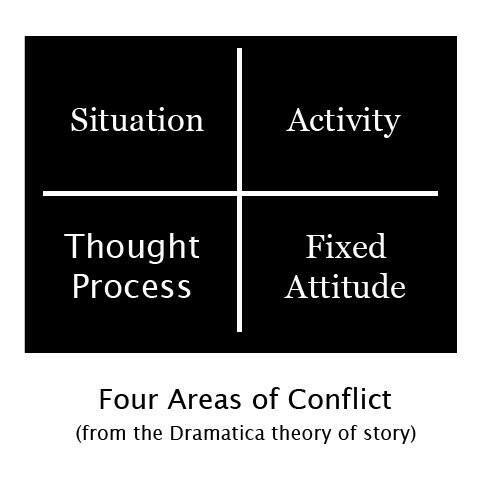 And yet, while these four perspectives may be relatively familiar to most, it is what they are looking at that is unique to Dramatica’s understanding of story. A Situation, a Fixed Attitude, an Activity, and a Thought Process. Think of a problem and it MUST fall into one of these categories. Racism? That’s a fixed attitude. Unjustly accused of killing your wife? That’s a situation. Wiping out an alien race? Definitely an activity. Brow-beating your wife. That’s a thought process you might want to reconsider. Regardless of what problem an Author invents, it will fall into one of these four areas. Cover all four areas where problems can exist and like the advice to include all four perspectives, An Author can insure that their story ends up well-balanced and completely argued. There won’t be any story “holes”. 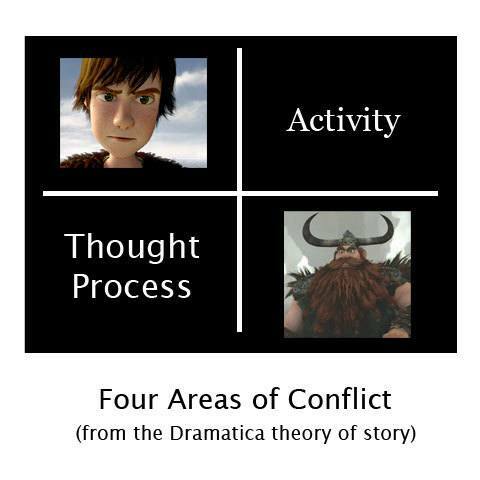 At the top level of Dramatica’s Model of Story sit the four Domains, or areas of conflict. The way one can begin to fully understand why a story feels the way it does (and why some feel more similar than others) is by applying the four Perspectives—or story Throughlines—to these four Domains. Any combination is acceptable save for one rule: the Main Character and Influence Character Domains must be diagonally opposed to each other. Why? The Influence Character’s primary purpose for being in a story is to compel the Main Character to deal with their personal issues. The very best way to do this is to give the Influence Character enough of the same kinds of issues do that the Main Character begins to sense that this new character offers an external reflection of themselves. This is where the common cliché of “You and I are both alike” comes from. If the Main Character’s problems lie in a Situation and the Influence Character creates problems because of their Fixed Attitude, well then you have enough of a similarity between the two that growth can occur. A Situation describes something externally stuck. A Fixed Attitude describes something internally stuck. Both are static (“You and I are both alike.”) The line of dialogue that usually follows, “We are nothing alike” occurs because, while they both describe something fixed, one is external and one is internal. They are not completely alike. This occurs in the animated film How to Train Your Dragon. Hiccup, the Main Character, finds personal trouble in his physicality, or Situation. He is a 98lb. weakling in a tribe of manly Vikings. “You just pointed to all of me,” refers to those issues. Because this is a father/son movie, Hiccup’s father Stoick assumes the role of Influence Character. Using the above rule from Dramatica, the Influence Character must be in a diagonally opposed relationship to the Main Character on the structural chart. This puts Stoick in Fixed Attitude and helps define the kind of impact he’ll have on Hiccup. Stoick. Stoic. Even his name confirms the placement! 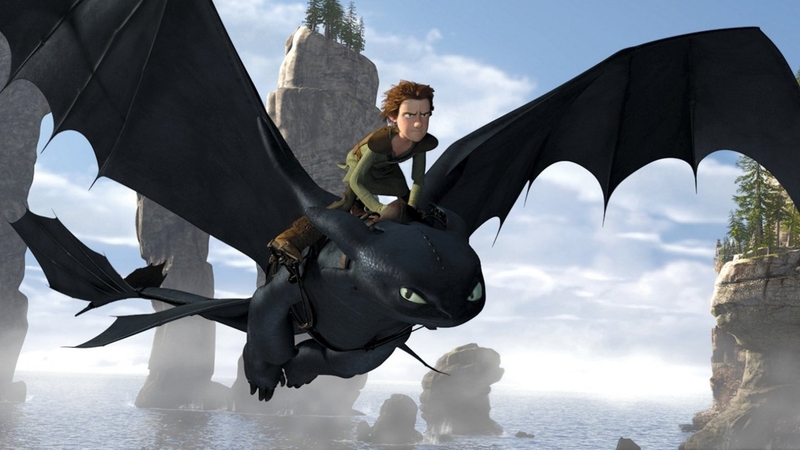 Interestingly enough, later on in the film Hiccup has the “He and I are both alike” moment, but uses it to describe his relationship with Toothless, not his father. While it helps explain Hiccup’s motivation for freeing the beast, its use outside of the norm tends to suggest that there should be even more exploration of their relationship beyond simply dragging sticks in the sand. It implies that there is still growth to be had in the relationship between them, when at that time their relationships was already rock solid. Dramatica considers this personality level of story structure—the Domain level—to be the most accurate and productive way to quantify Genre. Netflix, Apple TV, Blake Snyder and John Truby think of Genre in terms like Thrillers, Romantic Comedies and War Dramas. But beyond a handy shopping list of storytelling patterns, how truly helpful are these concepts in determining the scope of what it is an Author is trying to say? How helpful are they in balancing the story’s points of view? At best they identify the patterns. They never answer the question why? Everyone agrees that a story must have conflict. And while everyone also recognizes the necessity of seeing all sides of an argument, only one theory of story needs it for meaning. Dramatica moves beyond this reality by helping an Author build solid concrete arguments. With Dramatica, Genre becomes a tool for infusing personality into a story, rather than a simple cataloging device.